Yesterday, Minne-snow-ta had its first snowfall… of 5 to 8 inches! My boyfriend’s work closed down around 2 p.m. and since we are carpooling right now, I went home for the day as well. The roads were slick, but luckily with our recent move, we are super close to work and it didn’t take long to get home. I was so excited to spend sometime outside in the snow and enjoy the beauty of a fresh snowfall. This purplish-red wool-blend floppy hat is just another hat to add to my collection of fall/winter hats. I have been loving them lately (see here and here) and think this bright color will be nice when I’m usually picking out black, white and other neutral colors during the winter. 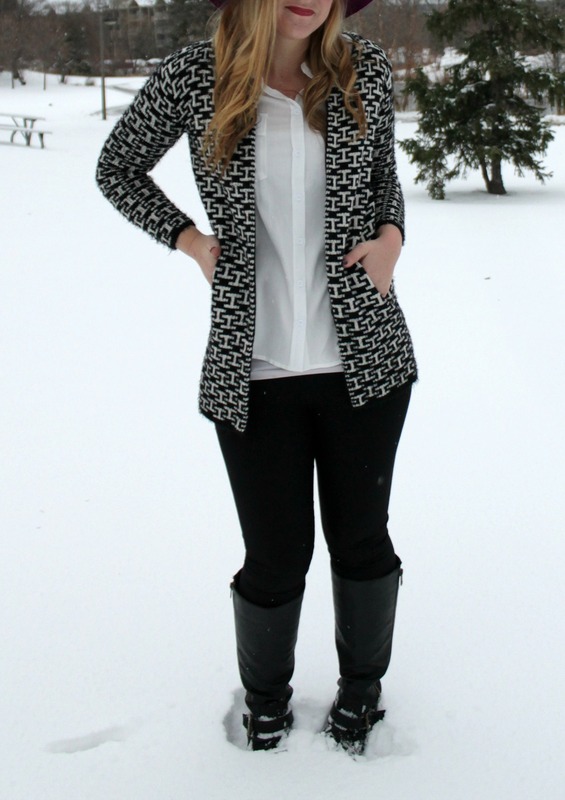 Along with a white collarless blouse, open face cardigan and leggings, this outfit is warm, yet stylish for a snow day. But I must mention, the color of this hat reminds me a little bit of Barney so I should probably avoid wearing it with shades of green haha! Also, I had to take advantage of taking photos yesterday because let’s be honest, I live in a dog-friendly apartment building aka the snow will be yellow everywhere in a few days lol! Previous Nordstrom Clearance Sale – Up to 40% OFF! Next 3 Year Blog Birthday! wow I can’t believe all the snow, you look fab. I love the hat. The color is so vibrant and pretty and really pops against the snow! I wish I was more excited about this weather. There is definitely something magical about the first snow, but I just wish it had waited a bit longer to appear! I can’t believe you are already getting snow and so much of it!! I also can’t believe how you manage to look so chic and calm while out there in it, LOL. I love this hat on you. Such a great color. Gotta love this snow:) We really did get it! Love those pictures and that hat is adorable! I went home early yesterday too and then the snow more or less stopped by me! I ended up taking advantage though and baked some goodies and enjoyed some time with my son! I love your pretty hat! Gorgeous photos!! This hat is so pretty and Barney did not even cross my mind. P.S. Hope to see you Thursday for TBT Fashion link up. Wow! Can’t believe you had snowy days already! 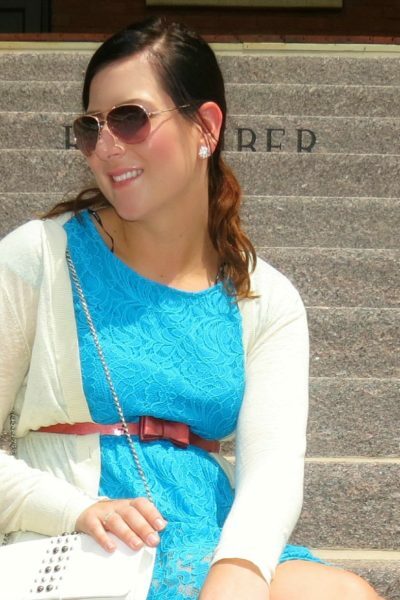 Love your cardigan! That hat is everything! The color + shape are perfection! These pictures are making me wish for snow! It has been in the 70s in SF! OMG!! I can’t believe you got that much snow already!! It’s 80 here today haha! You look so adorable! Love that Cardi and hat! I cannot believe all the snow already!!! So CRAZY!!! It gorgeous though and so are you!!! WOW!!! Stunning! Stay warm! You’re adorable in that hat! Hooray for snow days! I love this outfit! 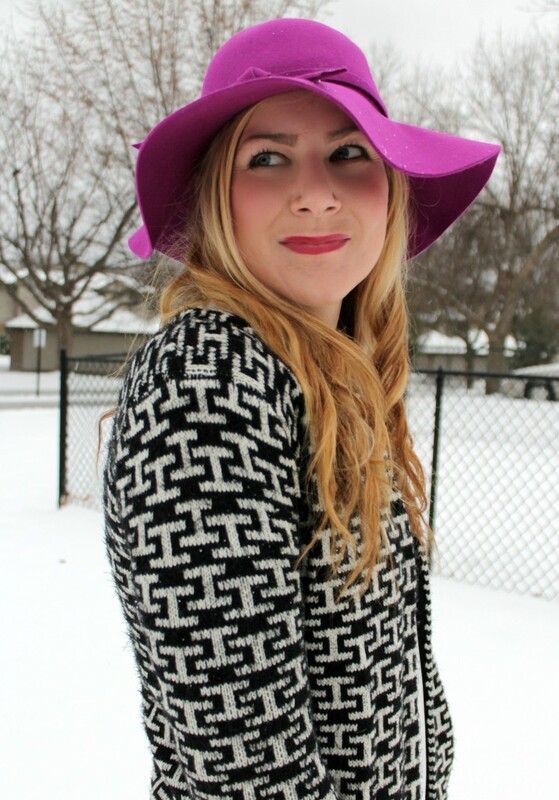 The pink hat with this black & white sweater is amazing! Wow! That’s a big first snow! 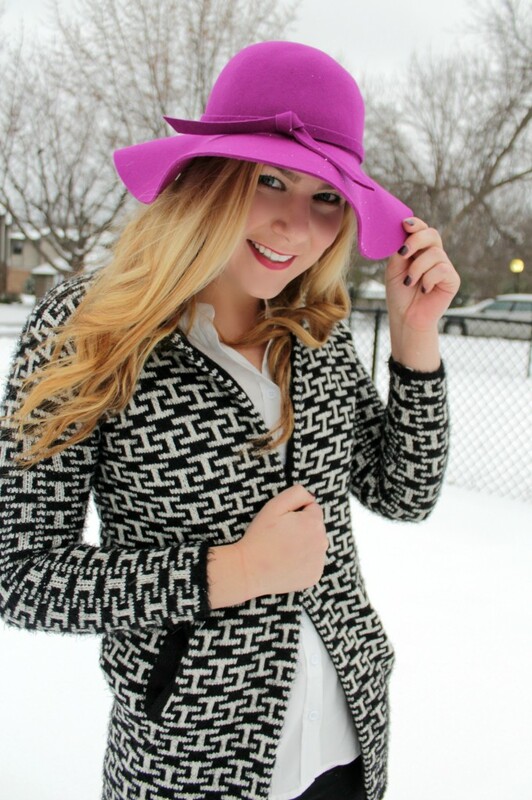 The bright hat really pops against the snow…gorgeous! I cant believe its already snowing where you are! so much for fall right? Beautiful hat! I can’t believe it has snowed already! Crazy! But I love love that hat and cardigan. Fab look! How exciting it’s snowing for you! We are starting to get beautiful summer days here which excites me as we leave our Winter! I love this look! You are absolutely gorgeous in that magenta hat! That hat is gorgeous, I love the color! I can’t believe it’s snowing there already! But your weather is headed in our direction I think. Hopefully the snow goes away by the time it reaches the east coast! Ahh, I can't believe it's snowing! These are beautiful though! Omg, SNOW! It’s been so long since I’ve seen a snow shoot, how funny. Love your outfit and the way that pretty pink hat pops against the white. Gorgeous, girl! Stay warm! That hat is so cute! And I love your jacket!! Obsessed with that hat and cardigan! You look great! Absolutely beautifu and that hat is gorgeous on you! Before reading your post when I saw the photos I was like is that snow lol? I cannot believe it. During the lunch hours here it is still warm enough to wear just a tee or light sweater, sometimes. 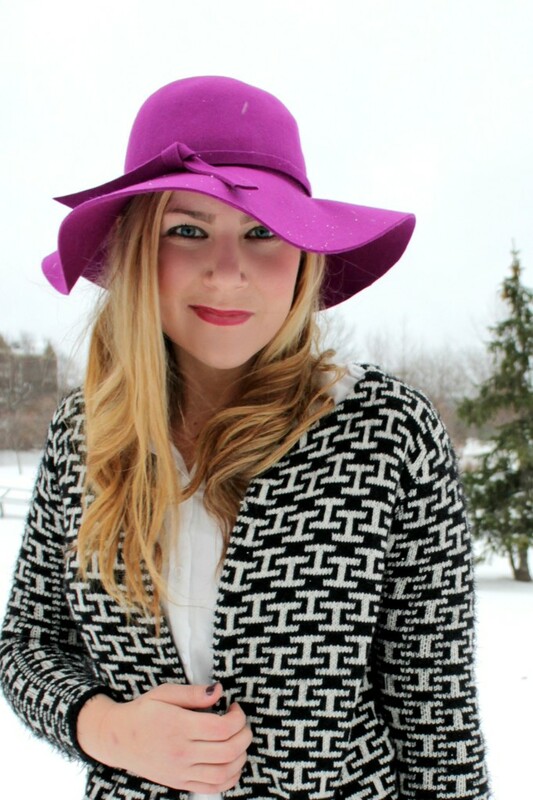 You look adorable in the cranberry hat and I love the b+w geo-print cardi! Rachel, I LOVED THIS POST! Love the snow – and most importantly you! You look adorbs with the colored hat (I’m obsessed!!) and the vest looks so comfty! Adore you, happy weekend! Ughhh, it’s started already!! We had another little storm today down south…enough to completely stop traffic on Hwy 35 for a while!! You look adorable in the snow, though!! The snow is beautiful! And I love the hat…I totally wouldn’t have thought about Barney. 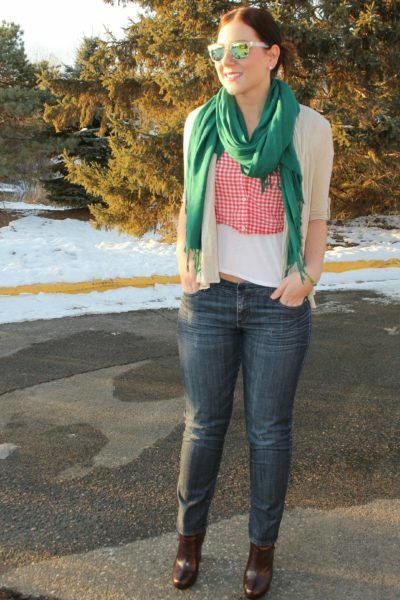 Its a great pop of color to a classic outfit. I adore the hat with the black and white. The colors are lovely together. Thanks for stopping by my blog.